Augustus Caesar (63 B.C. - A.D. 14) was the first Roman emperor. He was originally called Gaius Octavius Thurinus until he changed it per tradition after being adopted by Julius Caesar in 44 B.C. The statue of Augustus Caesar, Augustus of the Prima Porta. Discussed extensively in Zanker's text (cited infra), the statue exemplifies Augustus' shift towards a Greek-influenced portraiture. The man who would later become Augustus was born as Octavian from the gens Julia, an extremely ancient Roman family of patricians. The Julii were, despite their nobility, fairly unknown before Julius Caesar revived the fame of the clan, and were also fairly poor, despite their claim to direct descent from the goddess Venus. During his childhood Octavian was educated in Greek philosophy in Athens. His mother was Atia, and he had a sister, Octavia Minor. In Greece, and in Rome, Octavian gained two friends who would remain with him for his professional life: Myceneas, and Marcus Vipsanius Agrippa. The three were fast friends, especially in adolescence. Octavian's fortunes changed when, upon the death of his uncle Julius Caesar, Caesar's will was read, naming Octavian as his son-by-posthumous-adoption, not an uncommon practice in ancient Rome. Caesar had also left Octavian the duty of disbursing nearly all of the money he had accumulated to every plebian citizen in Rome. Upon his adoption, Octavian adopted his full name, Caius Julius Caesar Octavianus, taking his adoptive father's name and using his own as an adjectival ending, in the Roman tradition. The new “Caesar,” as he quickly came to call himself, immediately pushed for Caesar's will to be enforced, and his money to be distributed to the citizens. He also called for his “father,” Julius Caesar, to be deified by the Senate. As Caesar had become posthumously more popular with the plebeian class after learning that they were the beneficiaries of Caesar's will, the citizens of Rome clamored until the Senate acceded to the demands, deifying Julius Caesar, and building his Temple on the burnt remains of the Senate House. Octavian also succeeded in having Caesar's assassins, (Brutus and Cassius), declared enemies of the state, and also forced the Senate into condemning Caesar's assassination officially. Brutus and Cassius immediately fled the city. All was not well, though – Mark Antony was also attempting to portray himself as the rightful heir of Caesar's legacy, against Octavian's own claims. A sticking point was the enforcement of Caesar's will: Antony felt the money was his by right, but Octavian sought to disburse it to the citizens, as Caesar had requested. The two immediately fled the city, raised armies, and fought a small battle, which Octavian's forces quickly won, led to victory by Agrippa. In the meantime, Brutus and Cassius, who had fled to the East to raise an army, were returning to Rome to crush Octavian, who had now become the popular favorite to be Caesar's heir. As a result of the threat posed by Brutus and Cassius to both Antony and Octavian's designs, the two set aside their differences, and formed a secret alliance to defeat Brutus and Cassius. They sought the financial backing of Marcus Lepidus, and formed the Second Triumvirate to the ends of crushing Brutus and Cassius, and restoring order to Rome. To prevent their secret alliance from becoming public knowledge, and to raise funds, the three triumvirs ordered many prominent citizens killed, and their property confiscated. Marcus Tullius Cicero was one such target. The Triumvirate also disbursed Caesar's will to the plebeians, as Caesar had requested, creating instant popular favor towards Octavian and Antony. The forces of the Second Triumvirate easily defeated Brutus and Cassius at the Battle of Philippi in Greece. Octavian is said to have not participated greatly in the battle, Antony and Agrippa doing his fighting for him instead. This fostered a rumor at Rome that Caesar's heir was no such thing, but instead a weak and effeminate philosopher. After the reason for their alliance disappeared, Lepidus, Antony, and Octavian realized that conflict was inevitable. To postpone it for some time, the three partitioned the Roman Empire into three parts – Rome and the West went to Octavian, the wealthy East to Antony, and Africa to Lepidus. The three immediately began to consolidate their power bases for a conflict that they all knew would come. During this time, Octavian used his station in Rome to boost his public image. He portrayed himself elaborately as the “son of a God,” that is, the son of the Deified Caesar. He commissioned elaborate gold statues and coins, carrying the blazon ‘’Oct. Caes. Div. Fili’’, or “Octavian Caesar, Son of the God.” The provisions of Caesar's will, and his association with the popular dead ruler, made Octavian an instant favorite with the people of Rome. Thus he quickly consolidated his power. In the run-up to the actual conflict, Octavian continued to outmaneuver his other triumvirs. He threatened Lepidus into giving up command of Africa, and retiring to serve as pontifex maximus, a politically non-threatening religious post. He portrayed Antony as “captured” by the decadent East, enslaved by love to Cleopatra, and no longer even Roman due to his great love for Egypt. He secured Antony's secret will, which had recently been changed to request his burial in Egypt, as opposed to Rome, in the graves of his family. The Roman people were shocked to find what they saw as one of their own turning his back on Rome herself. Octavian played off of these feelings by accentuating his own “Roman-ness” by restoring old Roman traditions, such as the opening of the doors of the Temple of Janus in times of conflict, and the ceremonial casting of a spear into enemy territory by the ‘’fetiales’’, an order of Roman priests. In a re-hash of this ritual, Octavian himself acted as a ‘’fetial’’ priest, casting a spear into a plot symbolizing Egypt and Mark Antony to inaugurate the final conflict between Octavian and Antony. Whatever doubts about Octavian’s martial prowess may have existed, they were immediately wiped away by his shocking victory over Antony at the Battle of Actium. Historians dispute whether the conflict was as large as alleged by Octavian – it most certainly was not – but Octavian’s successful portrayal of the battle as an earth-shattering event lent him credibility. A denarius of Augusuts' corona civica, awarded for "saving the citizens" (ob civis servato). Upon return to Rome, Octavian met with the Senate, and “negotiated” a “Constitutional Settlement” in 27 B.C. At this “Settlement,” the Senate voted Octavian the new title “Augustus,” or, “the August One.” This title comes from the Latin word "augmentum" (an increase) or "augere" (to increase). This title reflects the position of an "augur." An augur was a soothsayer or fortuneteller who would try to divine the outcomes of events from looking at omens, especially the behavior of birds: i.e. birds circling over your head before a battle could be a bad omen. To give Octavian the title of "Augustus" was to impart a religious honor upon him. In effect, it would help portray him as a religious leader. At the Settlement, “Augustus” nominally surrendered his official powers, and returned control of Rome to the Senate. By this action, he claims he “restored the Republic” – ‘’res publica restituta’’ – and the Senate agreed. However, they and the people together “begged” Augustus to retain some official power, which Augustus finally relented to, assuming the rank of ‘’princeps’’, or “first citizen,” and accepting the title of Consul for the year. For “restoring the Republic,” the Senate also voted Augustus the honor of the ‘’corona civica’’, or the “Civic Crown,” an honor given to soldiers who saved the lives of a fellow citizen in battle. It was argued that by restoring the Republic, Augustus had saved the freedom – and therefore the lives – of all its citizens. Some cite this as the fall of the Roman Republic – when the Senate officially conferred ultimate power (although not in name) on the new Augustus. Reality is much more complicated. It cannot be doubted that Augustus moved the Republic towards a unitary power structure, but there is no proof that he did not intend to restore democracy eventually. He often remarked, “festina lente,” or, “make haste, slowly,” suggesting that a return to democracy would come, just not yet. He never held formal imperial power, towards that end, and continually rubber-stamped his actions with the seal of democracy. In sum, the formal tenets of Augustus’ rule show a challenging tightrope-walk between the need to hold authoritative power, to reconstruct his ravaged city, and his urge to both appear and be democratic. This tightrope walk officially only ended with the reign of Tiberius, but not during the Augustan age. He also resisted his own deification, which the Senate “pressed” on him during his life as well. He did not want to be seen as a new, self-obsessed tyrant, and towards that end, he even melted all gold statues of himself, re-dedicating the gold to the god Apollo, with whom Augustus nonetheless fostered a subconscious association in his subjects. Augustus also argued that Rome must return to normalcy after 100 years of civil war. His friends Myceneas and Agrippa helped in this goal. Myceneas, through a “Poet’s Circle,” encouraged and funded panegyrical poetry praising Augustus for restoring Roman virtue and honor. Livy received on such grant to write the Aeneid. Simultaneously, Agrippa rebuilt much of Rome that had been burned or harmed in the civil wars, but rebuilt it in grander fashion. The Pantheon was one such project, which now bears the inscription ‘’M. Agrippa, Cos. Ter., L. F., Fecit’’, or “Marcus Agrippa, Consul for the Third Time, Son of Lucius, Built This.” Agrippa also rebuilt Rome's sewer system (the Cloaca Maxima) to wide acclaim. 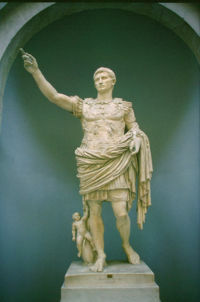 Despite his many successes in life – immortalized in the ‘’Res Gestae Divi Augusti’’, written shortly after his death – Augustus struggled in vain to find a successor who would carry on the tightrope walk that he had managed during life. Specifically, Augustus sought his friend Agrippa to follow him as ‘’princeps’’. The successorship plan is shown plainly on the friezes of the Ara Pacis Augustae, a great temple built to the Augustan era of peace, on which Agrippa walks just behind Augustus, clearly noting his intentions. Choosing his friend Agrippa over a family member suggests that Augustus did not intend Rome to become an empire or a monarchy, but perhaps wanted Rome to remain in tenuous balance between empire and republic for a while longer, under the close watch of someone he implicitly trusted. The ultimate goal may have been a restoration of democracy, when the time was right, or a benign philosopher-kingship, as envisioned by Plato, whom Augustus had studied. The true problem with this theory, though, is human mortality and fickle fate – without a just ruler, a philosopher-kingship becomes simple tyranny. This danger was realized when Agrippa died under mysterious circumstances. After several other successors died, in the end, the son of his wife Livia, Tiberius, succeeded him. Tiberius proved ultimately unable or unwilling to maintain Roman pretenses of democracy. Paul Zanker, The Power of Images in the Age of Augustus. Suetonius, trans. Robert Graves, The Lives of the Caesars: The Life of the Deified Caesar and The Life of the Deified Augustus. This page was last modified on 27 March 2019, at 18:07. This page has been accessed 64,421 times.